The Alliance of American Football did about everything wrong in its short existence, and particularly when it came to the treatment of its players. The one thing the AAF seemed to do right was give in to some early pressure and allow its players to sign with the NFL. More than 40 AAF players are getting a shot in the NFL, and that’s great for them. That still leaves a lot of players who might not be good enough to make the NFL yet but would like to keep playing professional football for a living. And the best non-NFL route for that, the Canadian Football League, is being cut off from those players out of work after the AAF’s horrible mismanagement caused the league to halt operations before its first season was done. We all know professional football is a business. We’re reminded of that often. But there should be some reason and humanity within that. Holding up players from pursuing other professional opportunities because you’re worried about a potential bankruptcy case seems very wrong. 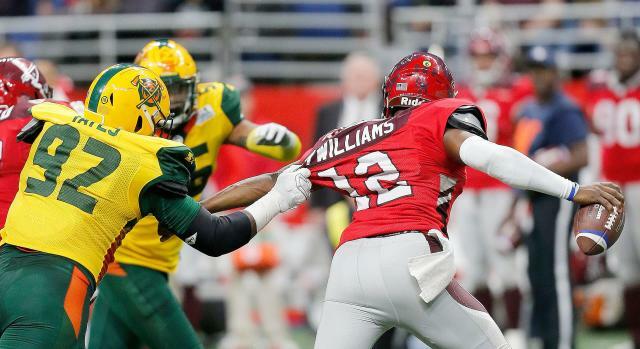 After a positive first weekend, the AAF exposed itself as a mismanaged mess. Even with the league shuttered, it continues to look worse and worse. The stories of the AAF leaving players to pay their own hotel bills and other inconveniences after the league folded were bad enough. The league was taken over by Tom Dundon, the owner of the NHL’s Carolina Hurricanes, and he quickly pulled the plug after saying he would invest up to $250 million. Dundon is a rich man, and presumably not many AAF players are independently wealthy. He could have treated them better, business or not. Schefter’s report is eye-opening. The AAF stopping players from pursuing opportunities elsewhere, after its egregious mismanagement left them without jobs, is hard to believe. Last week, there was a question if the AAF would let players sign in the NFL if they had opportunities. The league relented, and a few dozen players took advantage of a new chance. Hopefully the league realizes what a bad look its CFL stance is.